Long before Super Heroes patrolled the skies, mammoth monsters roamed the Marvel Universe – leaving wanton destruction in their wake. Now, they have returned! 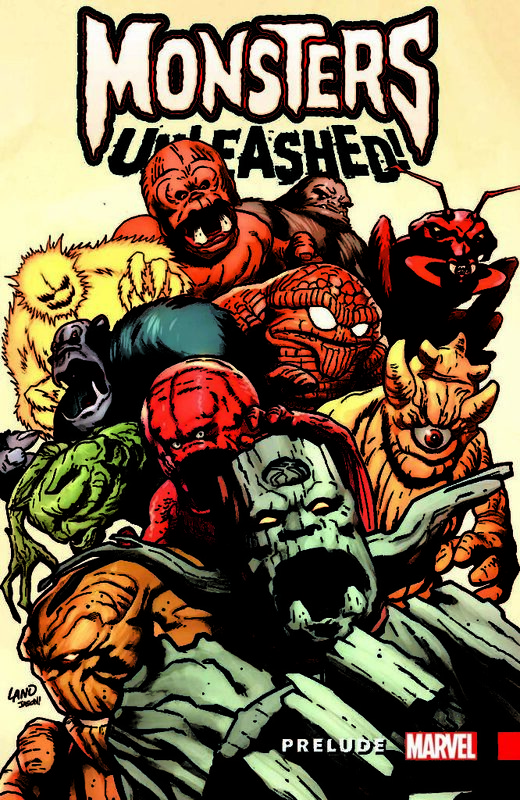 Before their explosive re-emergence in the all new spectacular MONSTERS UNLEASHED #1 – catch up on the rich history of these marvelous monsters with the MONSTERS UNLEASHED PRELUDE TPB coming to comic shops and bookstores everywhere in January! Peel back this brand-new cover from artist Greg Land and you’ll find a treasure trove of iconic stories and first appearances! Titanic tales from the past and present designed to get fans everywhere prepared for MONSTERS UNLEASHED! Before the can’t-miss first issue of Monsters Unleashed in January, meet a menacing menagerie of unforgettable monsters, Marvel mainstays, and some major players in Monsters Unleashed! Featuring Monstrom, Grottu, Moomba, Bruttu, Orrgo, Elsa Bloodstone, Lady Hellbender, Moon Girl and Devil Dinosaur and many more! MONSTERS UNLEASHED PRELUDE TPB collects FEARLESS DEFENDERS #8, MARVEL ZOMBIES (2015) #1, MOON GIRL AND DEVIL DINOSAUR #1, TOTALLY AWESOME HULK #2-3 and material from STRANGE TALES (1951) #73 & #90, TALES TO ASTONISH (1959) #11-13, #15, #17, #19 and #23; and TALES OF SUSPENSE #15, #17, #19 and #22.